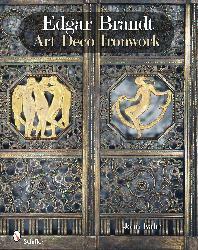 A premier metalsmith in the early 20th century in France, Edgar Brandt (1880-1960) designed and fabricated some of the most beautiful architectural and decorative ironwork of his age. This elegant book recounts his life and work with scholarly text and photographs. Lyrical gates, doors, and tables, including his most famous screen, L'Oasis, appeared at the seminal 1925 Exposition des Arts Décoratifs, in Paris, which gave the name Art Deco to the new style of designs. Combining motifs from ancient Egypt and classical Greek sources, floral and animals forms, and machine-inspired geometric designs, Brandt created items that became synonymous with the most lavish designs of the time. His workshop and showroom in Paris, along with a gallery that featured works by other contemporary artist-craftsmen, produced luxury goods and private commissions. Grilles, fire screens, doors, tables, andirons, vessels and lighting devices were exquisitely executed, and appear here to be studied and compared. Historians and art collectors interested in this fascinating period will find this book an invaluable reference.